I'm glad you've shown interest in guitar theory lessons, because that suggests you understand how important this knowledge is, not only to your guitar playing but your overall understanding of music. These lessons will help you connect your fretboard, chord and scale knowledge and deepen your understanding of how music works on guitar. This is crucial if you want to improvise confidently and come up with ideas in the moment. Many guitarists don't bother with this stuff, and I can only say they don't know what they're missing out on. I'm sure your results will prove most rewarding! 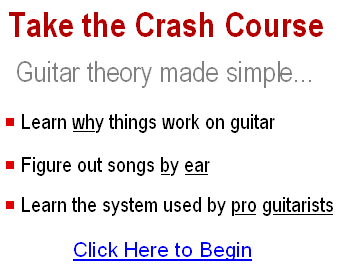 The problem is, a lot of guitar theory lessons out there are poorly explained and overcomplicated. I've made it my goal to teach guitar theory in a way that focuses your learning on only the most important concepts, explained in plain English. I'll introduce you to some terminology, but it will be backed up with clear and simple explanations. Note: please make sure you've been through the fretboard foundations section first! New to guitar theory? Take the foundation course here. The Major Scale Learning theory is far easier when you know the major scale. It's arguably the basis of western music, and the scale against which chords and harmonies can be referenced. This lesson gives you all the details and provides you with clear diagrams of the major scale in different positions. Chord Root Notes Introduces you to the theory behind how root notes work in forming guitar chords. An essential primer for the guitar theory lessons on chord construction below. Chord Scales This lesson will help you understand the concept of harmonizing scales and how you can pull chords from scales. In short, it brings together your knowledge of chord theory and scales into one system. Borrowed Chords Learn the concept of parallel keys and how the use of minor key chords in major key progressions can be related to a simple scale change. Triad Harmonization Learn how to build economical triad shapes in any key by harmonizing the major scale in 3 positions on the top 3 strings of the guitar. This will help you to explore more melodic expression with your chord playing. Relative Triads Using your knowledge of triad shapes, learn how we can play them over relative triads to create more complex harmony and melody. For example, what happens when we play Bm over Em? Chord Scale Relationships Shows you how to identify a "starting point" for your soloing by connecting scale patterns to chord shapes. This is about using your knowledge of those basic barre/movable chords from the chords section and superimposing scale patterns on those same positions. Sharps and Flats Ever wondered where sharps and flats come from? This lesson explains how sharps and flats are formed in scales and chords. It should also help you understand how important the major scale is in music theory in general. Passing Tones Learn how to identify and use passing tones in scales. These are tones you should avoid emphasising (e.g. holding onto) in your solos. Includes a backing track and ear training exercises to help you pick out the passing tones in the example scales. Scale Phrasing Learn how to build meaningful musical phrases from scales in your solos. This series will show you how to explore scales with purpose and beyond the linear meandering that so many players get trapped in when starting out with scales. Transposing Chords Transposition is about moving a collection of notes to a new pitch. This lesson looks specifically and transposing chord progressions to a new key using 3 simple methods. Arpeggios First learn how to build arpeggios block by block, then learn how to weave them into your guitar solos. This series introduces you to the world of arpeggios, how to construct them and how you can use them to enhance your solos and create more meaningful lead phrases. Modes of the Major Scale Series which looks at the 7 modes of the major scale. Each lesson takes you through the individual "flavour" and characteristics of each mode, with jam tracks to help you experiment with your own ideas. Finally, we learn how the modes work together as part of a larger musical expression.